Did Obama’s Actions Put SEAL Team Six in Danger? New details and names have emerged regarding appointees that Obama brought into our White House who allegedly have ties to the Muslim Brotherhood. This article lays out what we have learned and calls for an immediate Congressional investigation. It is no secret that Obama has embraced an enemy that openly states their desire to destroy Western Civilization and declares “Death to America.” Obama’s perplexing actions over the course of his Presidency appear to be more aligned with the agenda of the Muslim Brotherhood and United Nations than with America’s agenda. From Obama’s illegal war in Libya with U.S. military support to Al Qaida insurgents (under UN direction) – to his most recent war waged in Yemen – to the murders of 30 U.S. special operations troops which included 17 members of SEAL Team Six who took out Osama bin Laden, the truth about Obama’s actions and those he has placed in our White House must be found. “Tarek Fatah, founder of the Muslim Canadian Congress, author and self-described Liberal Democrat Marxist Muslim who campaigned for Barack Obama, revealed the identity of Obama’s White House appointees who have ties to the Muslim Brotherhood (see Muslim Brotherhood in our White House – Vetting Obama). Obama and Hillary Clinton are reaching out to the Muslim Brotherhood, a radical Islamic fundamentalist group committed to the destruction of America, Britain and Israel and identified as a terrorist organization by the U.S.
“Another Brotherhood-tied figure influencing the White House is Azizah al-Hibri. SEAL Team Six was in danger if Obama brought individuals into our White House who have ties to the Muslim Brotherhood – a terrorist organization that created Al Qaida, Hamas and the Taliban. It was reported that it was the Taliban who murdered our troops on August 6, 2011. There is no question that the Muslim Brotherhood would want to exact revenge for the death of Osama bin Laden. Obama not only enabled them by permitting public release of the identity of our troops, but he may also have unwittingly provided them with access to mission-related information from within the White House by his own appointees. Serious questions remain from the moment Obama allowed the release of SEAL Team Six’s identity up to the day our troops were murdered. How did the Taliban know that our troops would be in that location on that day? Who ordered our troops to use an inadequate National Guard Chinook instead of their SPECOPS Chinook which has advanced survivability capabilities? Where was the air support that was supposed to accompany our troops on that mission? After they were murdered, why did Obama release that militarily-devastating information to the public knowing it would embolden America’s enemies? Do not be fooled by the media mantra that Obama made a “gutsy call” to take out Osama bin Laden. Think about that for just a couple of seconds… if Obama had said “no,” he knew his political career would be over. Self-preservation left Obama no choice but to permit SEAL Team Six to carry out the May 2011 mission they had worked on for years to take out Osama bin Laden. It is what Obama did directly following the take down that is unspeakable. Releasing the identity of SEAL Team Six placed a bulls-eye right on their backs. Embracing the Muslim Brotherhood and potentially granting them access to military and National Defense information by bringing them into our White House is unthinkable. An investigation must be conducted to determine whether Obama’s actions, associations and appointees led to the murder of our brave beloved troops at the hands of the Taliban. The families of our troops have a right to know and our fallen heroes deserve justice. Congress must also hold Obama to account for the illegal wars he is waging in Libya and Yemen. All our soldiers remain at risk in any theatre of operation in the Middle East if Obama’s White House appointees have ties to the Muslim Brotherhood. Contact Congress and demand that they begin an investigation immediately. Do not forget – they work for us; we pay their salaries and elect them to serve us, not the other way around. As I opened this entry to check out its formatting, I have been watching the conclusion of “Inside 9/11” (2006) on NGEO. It is astounding that the United States of America is so duped, as to allow this to have occurred — and in our White House. There is more to relate and we will. This situation is FULLY CONDONED BY THE NON-PRESIDENT who is clearly a CLOSET MUSLIM and has DECLARED IN HIS BOOK to protect the MUSLIMS against anybody who attacks the MUSLIM ISLAM THUGERY!!! The “war on terror” is a ruse to usher in the Fourth Reich. Al-Qaeda has been a CIA asset since Jimmy Carter’s National Security Advisor Zbigniew Brzezinski recruited them to fight the Soviets in 1979 Afghanistan. 9/11 was an inside job! Check it out for yourself. I do not doubt this article. Go live in a predominantly muslim neighborhood for awhile and see for yourself. They are hateful and bigoted cult. I do not doubt the man mentioned was invited to the pentagon for dinner. It’s been in the news more than once about the military paying off terrorists to stop committing acts of terror and other stupid ploys similar to that. Oboma is the worst thing that could of happen to our country…GOD HELP OUR NATION..
Not only did O put the Seals in danger, he was their executor. Yes. I am NOT fooled ….. neither should anyone else be. He arranged for the Seals to die too…. Don’t forget his grandmother in Hawaii who was fixing to blowthe whistle on where he was really born. The Issa investigative House Com. is the one to do so along with Peter King’s House Com. I suggest we write to them , you too, to start an investigation to see if this charge is real, verifiable and can be dealt with now. You’re right Glenn. I contacted them; here’s their info. I hope many will contact them and insist on an investigation. It stinks,An investigation must take place & these people must be removed. When will the American people say enough is enough? As a 9/11 Family I find this in breech with the Constitution of the United States to the point of treasonous and seditious. Mayor Bloomberg is placating to the Muslim Brotherhood. God help us. It is no wonder to me that king Bloomie wants silent prayer so that the Islamic Sharia Law Muslims do not get offended. God help us. What is going to be next? There is a sufficient amount of credible evidence against Obama to warrant several different investigations , but the Congress does nothing, and Obama continues his planned destruction of our Republic. Thank you RINOs and Orangeman Boehner. YOU guys are allowing this to continue!!! Sadly, the media are noticeably silent as to the infiltration (with Obama’s help) of these radical Muslim leaders and sympathizers–even most of Fox News [where are you, Bill O’rielly?]. As an American citizen, and an old Marine (Korean War), I am dismayed and distressed that our 535 members of Congress are guilty of doing nothing practical to save America and its traditions. We must stop giving financial aid to countries who don’t appreciate it–not to mention that most of them hate America anyway. Just as we are individuals must place our family first, so should our government place America first. When we have no homeless, no poverty, and no deserving citizen in need, then we might assist other deserving nations and their peoples. According to an August 13, 2011 article by Gulag Bound, Barack Hussein Obama has three members of the Muslim Brotherhood working for him. Obama has also opened formal contacts with the Muslim Brotherhood and wants to support them with $3 billion. As a State Senator Obama said, we must have empathy for the jihadists who attacked this country on 9/11. He also invited the Muslim Brotherhood to attend his 2009 speech in Cairo, Egypt. The same Muslim Brotherhood who call for a “Civilization-Jihadist Process,” in which they would destroy the Western civilization from within. The Muslim Brotherhood says the White House will become the Muslim House. They state, we do not want to democratize Islam, we want to Islamize democracy. That is what we want. Sharia law is not compatible with the US Constitution. Then again the Obama Regime does not care too much about the Constitution either, and wants to change it. The Muslim Brotherhood is a mortal enemy of our civilization. Their slogan says so openly, their way is Jihad, and their method is death. If Barack Hussein Obama has members of the Muslim Brotherhood working for him; and if decides to support the Muslim Brotherhood with $3 billion would he not be violating his oath of office he swore to, which is to uphold and defend the Constitution? Would this act be considered giving aid and comfort to the enemy, which would be considered an act of Treason? The President can be impeached for an act of Treason. Obama shows weakness to the world, thus endangers Americans. If Obama decides to go through with supporting our enemy The Muslim Brotherhood, will Congress have the COURAGE to impeach him? Problem is Congress has nothing to do with impeachment.. Only the Senate can do that and the Obamnation doesn’t have to leave office even if he’s impeached.. With the Senate being Democraps they aren’ t about to do it. We really don’t want him impeached b/c then we are stuck with every EO he’s signed and anything he’s done from Nov.9,2009 to present. If we can get him removed for any other reason then everything he’s done is moot like it never existed .. Which means Biden, holder .Napolitano the whole damn Obamanation administration disappears as if it never was!! Obama is an animal that can’t survive with out someone telling him what to do. muzlins have a world wide network.owning gas stations and motels in usa.chances are,your doctor is a rag head,refuse to support them.i do.never buy campbells soup or v-8 juice. A lot of people were so proud to have our first black president. Well, nobody did any good at appologizing for American slavery. American blacks associated him with their “plight” and appologetic whites thought this would help sooth hurt feelings. Well, Muslims don’t have a middle class. They have the ruling class and the slave class. Wealthy muslims send their children to American colleges and educate them of American ways so they can figure how to defeat us. Well, Obama’s father was one of those muslims sent to an American college by his wealthy slave-managing parents. His parents were muslim, his grandparents were muslims, his cousins are muslims, his half brothers and sisters (if he has any) are muslims. Do you think that he could, or would turn against his own? He can’t do anything harmful to muslims because his family is muslim. And, HE isn’t muslim???? I was on PLAVIX after having 2 stents put in,,in Jan 2006. I had to start taking PROTONIX after discovering too much acid,,hiatel hernia,,barretts syndrome. PLAVIX and PROTONIX together NO PROBLEM. “BUT” when I had a Pacemaker put in I had to go on Coumadin instead of PLAVIX,,’NOW” I’m tired ALL THE TIME,,HELP ANY IDEAS??? This President and his staff is the worst thing that has happened in America! This first lady how dare you to tell us how to eat!! You just tske care of your husband and 2 daughters!! !We all know how you eat! You are a HYPOCRITE!! !You don’t even LOVE America!!!!!! So You can get to moving and let us alone!!!!!!!!!!!!!!!!!!!!!!!!!!!!!!!!!!!!!!!!!!!!!!!!!!!!!!!!!!!!!!!!!!!!!!!!!!!!! !We we want to gain 200lbs. that up to us!!!!!!!!!!!!!!!!!!!!!!!!!!!!!!!!!!!!!!!!!!!!!!!!!!!! !You and your husband should be ashamed of yourself and hang your head in SHAME!!! Most people realize that your husband is taking AMERICA down!!! !I would ask for forgiveness if I were you!!!!!!!!!!!!!!!!!!!!!!!!!!!!!!!!!!!!!!!!!!!!!!!!!!!!!!!!!!!!!!!!!!!!!!!!!!!!!!!!!!!!!!!!!!!!!!!!!!!!!!!!!! I think WMD and Guandolo just smeared a good man in a drive by here. The Navy commander they call a “Muslim Brotherhood-connected agent of influence”? He wrote a book *against* MB and various other jihadists, published by U.S.Naval Institute, called “Militant Islamist Ideology”. He has been in the thick of it as a good and loyal serviceman. I’ve been in the Navy since ’85–I stand by him and call for a correction and apology. You can contact me on the unpublished email for my bona fides if you need details. Looking at Chap’s post: I just read part of the book he mentions. Specifically, calling the author of “Militant Islamist Ideology” a Muslim Brotherhood-connected agent of influence is nonsensical. Reading the book mentioned it makes clear that the CDR’s position is plainly one of eroding all support for Muslim Extremist groups such as al Qaida by explaining how they have used tiny parts of the words of Allah and Mohammed to gain support for their cause. 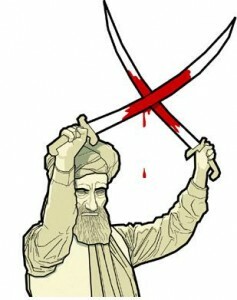 He also defines for his readers the differences between Islam – a faith of over one and half BILLION people, Islamists (who promote having the political and religious systems follow each other and the imposition of sharia law) and Militant Islamists – the tiny fraction of that population who promote the Islamist’s goals through violent means. The CDR specifically outlines how the US can defeat Militant Islamist groups using very specific techniques too nuanced to outline here, and provides a broad outline of how the three groups mentioned above fit together. Lack of education about these groups seems to be a recurring theme. I’m quite concerned for your continued credibility that you have glossed over an “Arabic-sounding name” and decided to attack the person instead of actually doing research to educate yourself before publishing this information. By the way -did you know that this is an American Citizen you’re speaking about? He was born in Mississippi. I hope you will respond to these calls for clarity for your own redemption. I have never heard of any apology by the Islamic majority whenever a Muslim extreemist kills a non Muslim. When will people understand that Obama DID NOT get Osama bin Laden! Bin Laden was murdered years earlier! Benazir Bhutto identified the murderer before she was assasinated! Get a clue people – Islam and other religions will never get along. Face it! It just might, most likely, end our world and life as we know it. Better get right with the right God and hold on with all your might.